Today ( Well this morning ) at 12:01A.M. GM made the announcement the long anticipated "Bad Boy" is real and ready to roll. We've go the photos, the scoop, and the specifications. CLICK HERE ! A Day Late And A Dollar ( Make that many dollars ) Short! GM today a price adjustment on most of its 2008 model year vehicles to partially recover increasing steel and commodity costs. The price increases, averaging about 1.5 percent, are effective with vehicles invoiced to dealers on and after December 19, 2007. If your order was in the system you are unaffected, but, as of today, A Corvette Coupe will cost you $1500 more, a Convertible $1600 more, and a Z06 $1000. DETROIT - Corvette Racing, the most successful team in the history of the American Le Mans Series, will compete in the GT1 class in all 12 events on the ALMS schedule in 2008. Chevrolet's two-car factory road racing team will also return to the 24 Hours of Le Mans in pursuit of a sixth GT1 title in the world's most famous sports car race. "Corvette Racing was conceived as a long-term program to showcase the performance, technology, and value of Chevrolet's world-class sports car," said Mark Kent, director of GM Racing. "Since the team's competition debut in 1999, Corvette Racing's success in top-tier road racing has produced a strong return on our investment, paying dividends in marketing, engineering, technology transfer, personnel development and other areas of our business. Corvette is now a performance icon that's recognized around the world, and Corvette Racing's continued participation in the ALMS and the 24 Hours of Le Mans will be an important element in the global celebration of GM's 100th anniversary in 2008." Corvette Racing has won seven consecutive GT1 manufacturers and team championships and six straight drivers championships in ALMS competition. The team holds the series' records for class victories (57) and 1-2 finishes (40). "Our decision to compete in all 12 rounds of the ALMS schedule in 2008 reflects our commitment to our sponsors, our suppliers, and to Corvette enthusiasts worldwide," said Steve Wesoloski, GM Racing Road Racing Group manager. "There is a reason why thousands of Corvette owners attend Corvette Corrals at ALMS events and why the autograph line at Corvette Racing is the longest in the ALMS paddock: Racing is an integral part of Corvette's history and heritage, and we are continuing that tradition. "Experience teaches us that motorsports is cyclical, and the GT1 category is currently in transition," Wesoloski observed. "Would we like to see more competition in GT1 in the ALMS? Absolutely! But in the absence of season-long competition, we are absolutely committed to controlling our own destiny. We are pushing hard to develop our chassis and powertrain, to refine our race strategy, and to continuously improve every element of the program. We know that the competition at Le Mans will be intense, and we will use the ALMS series to hone the race cars, the drivers, and the team to prepare for it." Corvette Racing will test two new Compuware Corvette C6.R race cars in February in preparation for the season-opening round of the ALMS series, the Mobil 1 Twelve Hours of Sebring, on March 15, 2008. If you love the Corvette Pace Cars, then you will want to reserve your spot at the Indy Pace Car unveiling taking place at the Indiana Convention Center/RCA Dome in Indianapolis, IN on Thursday, December 27. We have been offered a limited number of tickets to the unveiling and have only a few left. Chevrolet Exhibit Viewing – See the Corvette Convertible, Camaro Convertible and 2008 Indy Pace Car. Participants will also see a surprise display – the “Flying Corvette”! Lunch at the show in a designated ballroom to mix and mingle with GM/Chevrolet representatives. The unveiling and NIAS is fast approaching. You’ve read the rumors. You’ve heard the buzz. Now ride shotgun as Johnny O' a lap at Laguna Seca road course in California in a brand-new 2009 “mystery Corvette.” Turn the volume up and listen to that LS9 Corvette Quarterly Website. Our 2008 Hall of Fame inductees were selected last week as part of our 4th quarter NCM Board of Directors meeting. Corvette racers, Allan and Donald Barker; Corvette tuner and engineering specialist, Reeves Callaway and early Corvette developer, Maurice Olley will be inducted into the Corvette Hall of Fame as part of our 14th Anniversary Corvette Celebration over Labor Day weekend. *Allan & Don Barker – A brother racing team that competed from 1957 through 1972, compiling five Sports Car Club of America National Championships – four of which behind the wheel of B Production Corvettes. Allan Barker’s racing championships were achieved with the assistance of his brother Don acting as chief mechanic. * Reeves Callaway – Founder of Callaway Cars, racer and tuner/car constructor, whose engineering achievements in the Corvette performance arena began with the factory RPO B2K Twin Turbo Corvettes (1987-1991).Achievements continued with the development of the world-record holding 254mph "Sledgehammer", C4 Aerobody package, LT-1 and LT-5 SuperNatural™ Corvettes, C12 Callaway Supercars, C5/C6 power group packages, and the current C6 Supercharged Corvettes/C16 Supercars. * Maurice Olley – Working along side Harley Earl and Bob McLean, Olley developed the chassis and suspension of the first-generation Corvette. Acting as head of Chevrolet Research and Development, he headed the engineering team that worked to perfect the early Corvettes and hired Zora Arkus-Duntov to continue the improvements. Special anniversary gold design to commemorate the 50th running of “The Great American Race”With defending Daytona 500 Champion Kevin Harvick at the unveiling, surrounded by Chevrolet, General Motors and Daytona International Speedway officials, hundreds watched the much-anticipated unveiling of the 2008 Corvette Z06 Daytona 500 Pace Car – the Official Pace Car of The Daytona 500, NASCAR’s biggest, richest and most prestigious race. The 505-horsepower vehicle, which has more horsepower than the NASCAR Sprint Cup race cars it will pace, was unveiled with the pomp and circumstance worthy of automotive royalty at the Orange County Convention Center in Orlando. It is the fifth consecutive year that Chevrolet has chosen the Corvette to pace the iconic NASCAR event and the Corvette Z06’s special “anniversary gold” appearance represents one Chevy’s most uniquely designed pace cars. GM Design developed a striking paint scheme with an exotic array of stunning hues of Gold, Red, Blue and White. The graphics scheme is accented with unique, gold iridescent-coated wheels. · Curb weight of 3,162 lbs. Catch the world premiere of National Geographic’s “Ultimate Factories” and watch the complete story of Corvette’s build - Thursday, November 29, at 10 p.m. ET/PT. Starting at the Dana Plant in Hopkinsville, Ky., where the aluminum skeleton, or space frame, is built in just 18 minutes and follow through to Bowling Green, Ky., where the floors, doors, panels and paint are added, as well as the power seats, the dashboard and one distinctive Corvette feature, the classic teardrop rear window. Footage also includes GM’s Performance Center in Wixom, Michigan where the revolutionary Z06 engine is hand-built like a race-car engine, by one technician in four hours. Retailers will tell you that on BLACK Friday there is always a SILVER lining. This will never be more true than on Thursday, December 27, 2007 when a very special present from Corvette Santa is unwrapped. We will bring the announcement to you right here as it unfolds on this very special day for all the world to enjoy as we look forward to an exciting 2008… another year of Corvette FUN! Wil Cooksey Retires after 15 Years as Corvette Plant Manager! Paul Graham Appointed Plant Manager of GM Bowling Green Assembly Plant. General Motors today announced that Paul Graham, currently assistant plant manager of its Fairfax Assembly plant, is appointed plant manager of its Bowling Green facility, effective Jan. 1, 2008. Wilmer Cooksey, the current plant manager at Bowling Green, will retire, effective March, 1, 2008. Graham began his GM career in 1980 as a college student intern at GM Truck and Bus in Flint, Mich. In 1986, he became an associate manufacturing engineer at the plant, then moved on to become a supervisor of production in 1987 at the GM Ft. Wayne Assembly plant in Indiana. Graham held several positions at the facility before being promoted to senior manufacturing project engineer in GM's Truck and Bus Division in Pontiac, Mich. in 1989. In 1992, Graham moved on to GM Baltimore Assembly in Maryland to assume an assistant superintendent of Maintenance position, and over the years held positions of increasing responsibility at the plant before returning to GM Ft. Wayne Assembly to an area manager of the Body Shop position in 1995. In 1997, Graham expatriated to Guanajuato, Mexico to assume a platform program manager position with GM of Mexico. In 2000, he returned to the United States and was appointed assistant plant manager of the GM Shreveport Assembly plant in Louisiana. Graham was appointed assistant plant manager of the GM Oklahoma City facility in 2005. He was appointed to his current position in 2006. Graham holds a bachelor's degree in Mechanical Engineering from Kettering University (formerly GMI) and a master's degree in Project Management from John Hopkins University. Under Wil Cooksey's direction, the Corvette has received numerous awards including "America’s Best Automobile of the Year" by Automobile Magazine, "Best Premium Sports Car" by J.D. Power, and "Best Sports Car" by Money Magazine. In May of 2002, the Bowling Green Assembly Plant was awarded two prestigious awards. J.D. Power & Associates named Corvette as "Best in Segment" for the second year in a row and recognized the assembly center as North America’s Silver Plant. Wil will not be away from Corvette for long though... Starting next year, he will be the Chairman Of Board for the National Corvette Museum. The directors, members, and staff of the C5-C6 Registry congratulate Wil on his successful career and for his role in making Corvette the best sports car in the world! We want to thank Wil for his help, friendship and support over the years.. Thanks Wil, it's been fun, and a great ride! Congratulations “Build Your Own” Corvette Raffle Winner! Congratulations to Ken Almer, drawn this afternoon as the winner of our “Build Your Own” Corvette Coupe/Convertible raffle drawing! Ken is from Oro Valley, AZ and owns a 2002 magnetic red convertible now, but he has never been to the Museum. He was familiar with the Delivery Program because several members of his Corvette Club have taken delivery. He said he has never won anything before, but thought he would take a chance on this raffle, and he is so glad he did. Thanks to everyone who participated on this fundraiser. Your next chance to win a new Corvette is coming up on Wednesday, December 5 at 2:00 p.m. CT! Only 500 tickets are being sold at $250 each. 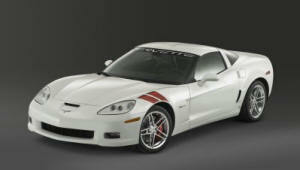 http://www.corvettemuseum.com/raffle/index.shtml or call us at: (800) 53-VETTE. You just might be our next Corvette raffle winner! According to Strategic Vision’s Total Value Index (TVI), just released, General Motors had four vehicles that achieved Total Value leadership positions. The leaders included: Chevrolet Corvette/Corvette Convertible, GMC Sierra 1500 and 2500/3500 models. GM’s 100,000 Mile/5 Year transferable powertrain warranty had a strong impact in reassuring Sierra customers that their investment was more secure than other competitive models. GM has been the top domestic manufacturer in the study for five years running. Honda, with its strong brand recognition, which consumers associate with resale value, was the industry leader in the study with six vehicles in leadership positions. Toyota, like GM, placed four vehicles in the top of their segments, followed by Ford with three leaders, including the Lincoln MKX which outscored the Lexus RX 350. TVI results are based on ratings of new owners who purchased their vehicles between October 2006 and March 2007. They were asked to comment about expected reliability, expected fuel economy, price paid, expected resale value and other factors specific to the ownership experience. Continued favorable results in third-part studies, like Strategic Vision, J. D. Power Associates and others confirm GM’s commitment to providing customers with high quality cars and trucks. Registration for the NCM’s NAIAS private unveiling event in Detroit on January 19, 2008, will open via The NCM website at 8:00 am CT on November 19. The event registration will be open to “members only” from November 19th to November 30th, with any remaining slots being offered to non-members. There are only 200 tickets available for this special event. Tickets are $125 per person, and your reserved ticket includes, event show pass, transportation to and from the event to the central meeting point and a commemorative GM/NCM long-sleeve shirt. 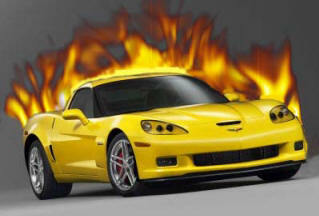 Visit www.corvettemuseum.com on November 19 to register. You too can purchase a copy of Leno's E-85 CORVETTE Hot Rod ! A bone stock Z06 will cost less, but then you wouldn’t be buying a car from the builders of five-time Le Mans-winning GT1 C6.R machines. Jay Leno wanted a unique Corvette, so, Pratt & Miller and Katech built this 600 - hp monster that can be run on E85 ethanol for him. Under the hood is a 8.2-liter (up from the donor Z06's 7.0 liters). The new engine uses LS7 cylinder heads and intake and exhaust manifolds and runs at the same 11:1 compression ratio. Custom-forged crankshaft, rods and pistons replace original parts, and will burn either gasoline or E85. The factory roof, deck lid, doors and mirrors remain from Leno's original Z06, but all of the other body panels are new and were inspired by the race car. Some features to round out this ride include: Arvin Meritor Dynamic Ride air suspension, functioning ram-air hood intake, heat-extracting louvers, BBS-engineered wheels, Brembo Brakes, cooled by carbon fiber ducts, 14" in front and 13.6" in the rear, and custom tool kit containing a three-piece, 48-inch, 600-lb-ft torque wrench needed for removing and installing the wheels, torqued down at 550 lb-ft. The first saleable car will be made April 1st with 25 scheduled for production in 2008. Members – While at the Corvettes at Carlisle it became pretty clear from your reactions and comments that the two choices of specialty interiors known as the LT4 option, or Luxury Trim 4 Big Bucks, needs some help! It seemed almost like in unison, the question was asked, and asked, and asked… Where’s the ALL Black??? It was obvious that the Sienna and the Linen C6’s on display were pretty spectacular in their own way, but they were not enough to satisfy the “purists” among the Corvette enthusiasts! A quick review of the 2007 model year production numbers verified that 6 out of 10 C6’s had all Ebony interiors. Rumors are flying amongst our Corporate Member dealers that the Corvette Brand team has been listening to dealers and owners across the country and are considering introducing an all black LT4 trim option. This will be a HUGE home run for Corvette if and when this happens. There is no question this would be the right move for Corvette, and we know our members would support this wholeheartedly! The Corvette is equipped with the latest in tire pressure monitoring hardware and software. Each wheel has a sensor mounted in it that transmits electronic signals through the air to a Tire Pressure Monitor (TPM) Receiver. The system is designed to monitor tire pressure and alert you if conditions warrant your attention or action. Read More! Click Here! SPECIALTY CORVETTES SHOULD CONTINUE IN 2008! Members – As Hot News unveiled on February 2, 2007 Corvette enthusiasts in search of a unique ride have much to consider this year with the introduction of two special-edition models: the Ron Fellows ALMS GT1 Champion Corvette Z06 and the Indianapolis 500 Pace Car Replica Corvette Convertible. What was true then is true now. Another year, another group of special edition Corvettes should be on the way! Of course, Chevrolet never admits to anything, but with the recent success of the models mentioned above, it only makes sense to continue this trend through the 2008 model year. Members, this is no surprise to us, the enthusiasts, but we all know that Corvette owners love having a limited edition model, with the emphasis on LIMITED numbers! Again, looking back into history is the best guide into the future. Ron Fellows Z06 was so popular, why not for 2008 introduce another Special Edition Z06 flagship that might commemorate the 55th Anniversary of America’s #1 Sports Car? After all, Tom Wallace, Vehicle Line Executive for Performance Cars, has been sending us a subliminal message with the 2008 newly designed 5 X 5 open spoke wheel design for the 55th year of Corvette production. Hmmm…. 5 spokes next to 5 spokes… 55th year… Why not? Since we’re talking about repeating the success of 2007, isn’t it interesting that the first Corvette to pace Indy happened in 1978 and there have been nine, yes nine Corvettes to pace Indy since. And isn’t it amazing that 2008 just happens to be 30 years since that first black and silver Corvette paced Indy for the world to see? So wouldn’t a 10th Indy Corvette Pace Car be just the perfect addition to a Corvette enthusiasts’ garage? You sure would look good sitting behind the wheel, cruising your home town in the next great Corvette Collectable! JOIN US FOR THE CORVETTE SUPER CAR’S INTRODUCTION! 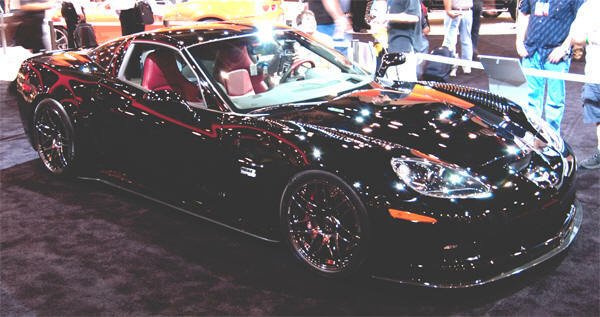 Members – Be sure to join us at Cobo Hall in beautiful downtown Detroit, MI for the Corvette Super Car’s introduction. 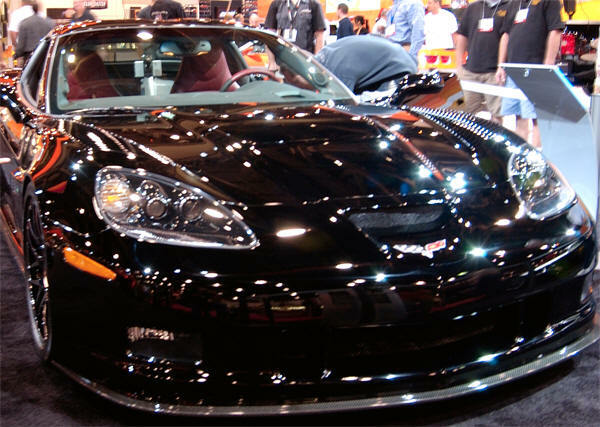 Chevrolet has teamed up with the National Corvette Museum to coordinate the registration of the first 200 lucky Corvette enthusiasts who sign up to enter the show on Saturday, January 19, 2008 prior to the public opening. Event registration will include transportation to and from the show, a commemorative event shirt and show admission. There will be a special rate block of rooms available to those who choose to stay overnight as part of the event festivities. You will need to register through the NCM website when this event becomes live in early November. They will post advance notice ONLY in the NCM eNews, so if you haven’t already signed up for this valuable service, do it today! Go to www.corvettemuseum.com/ncmenews/index.shtml for instructions. This exciting event will sell out quickly so keep an eye on the NCM eNews to stay up to date! CORVETTE SUPERCAR GET A NAME..........maybe. Keep in mind the above is speculation, we know Tom Wallace favors the name "SS" and when he speaks of the car, he calls is SS. The original name ZR1 referred to an engine package in the 1971 Corvette. The ZR1 included the LT1 Engine, M22 Transmission, heavy-duty power brakes, transistor ignition, special aluminum radiator, and special springs, shocks, and front and rear stabilizer bars. ZR1's also had metal fan shrouds. The ZR2 was similar to the ZR1 except the ZR2 package included the LS6 454ci, 425hp engine. The base engine was a 350ci V8 producing 270hp. ( From the Idaho Corvette Page ). It was and is rumored ZR stands for "Zora's Racer". The 1990 version referred to the whole car package. The ZR-1 had a dash in the name and an engine with, Lotus-designed, Mercury Marine-built 375-horsepower, 32-valves, quad-cam V-8. 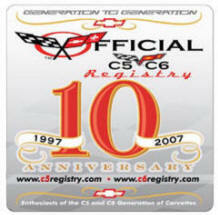 The C5-C6 Registry will be at NIAS in January for the unveiling... we'll keep you posted and let you know what the official handouts say! Today, GM announced its all-new "Personal Audio Link" iPodR adapter for Chevrolet HHR, Chevrolet Cobalt, Pontiac G5, Pontiac Solstice and Saturn Sky is now available from all Chevrolet, Pontiac and Saturn dealerships. This may be a step forward for iPod/Corvette owners. Inside sources have told us the audio system on Corvette is too complex to retrofit and iPod or MP3 connection. But, perhaps this new "Personal Audio Link" may be an answer.... It would be nice to use listen to your iPod tunes over the quality Corvette audio with a "wired" connection before the arrival of the C7 launches. Especially with the new iTunes enhanced audio files at the extra cost. We'll keep you posted! It was a great year for the plant, a record-breaking year for the number of Corvettes built on only one shift of production: Total builds: - Corvette Coupe 21,484; - Corvette Convertible 10,918; - Corvette ZO6 8,159 -- Total Corvette production: 40,561. There were four special editions in this model year – the Ron Fellows ZO6 and the Indy 500 Pace Car replica in Corvette, as well as the Passion Red exterior and Platinum edition XLR. The builds for -X LR 1,095; - XLR-V 410 Total - XLR production: 1,505. Up Date July 18th: We found one item missing on the list! As you know, option D30 is to have your CORVETTE built "your way", Well, it seems, The D30 Option Code was not on the production code list mentioned above. There were 126 orders with the D30 option for color combination override in 2007. CLICK HERE ! for the 2007 stats list.